On Sunday I met real fishermen. 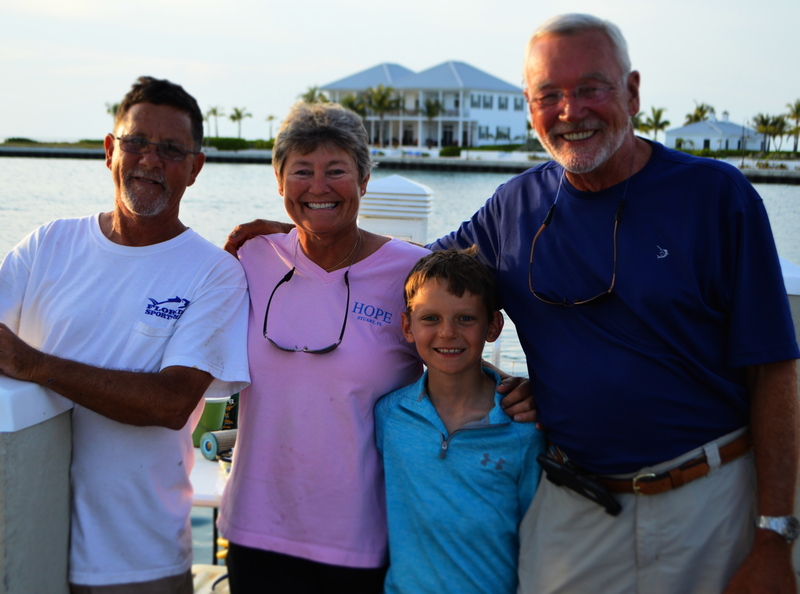 They have a 55 foot sport fishing boat called Hope. I was asking them lots of fishing questions for a few hours. Then, the best thing ever happened. They asked me if my dad and I wanted to go fishing with them the next day. I ran like crazy back to our boat and asked my mom and dad. I was afraid they were going to say no. First I asked my dad. He said yes. Then I asked my mom. And my mom said the magic word, “Yes”. I ran back to their boat and told them, “I’m in!” They were so excited. They said to be at their boat at 7:30 in the morning. Here’s a picture of me with Mrs. Margaret, Mr. Tom, and Mr. Mike right after they asked me. I couldn’t sleep that night. I was WAY, WAY, WAY too excited. I was so excited that Dad and I showed up 15 minutes early to their boat. As we left the harbor, Mr. Tom hit the gas and we went flying. We had to have been going at least 25 knots. I couldn’t even keep my hat on we were going so fast. I loved it. We trolled along the ridgeline where the water goes from shallow to deep. This is where lots of good eating fish live. We had been trolling for an hour and there was no sign of fish. I was laying in a bean bag chair up on the bridge of the boat watching the water and relaxing. Then Mr. Mike yelled, “FISH ON!! !” I went flying down the back stairs and Mrs. Margaret told me to get in the fighting chair. I can’t believe they asked me to be the first person in the fighting chair. I’ve dreamt about this moment for a long time. It was a girl Mahi Mahi. It took me ten minutes to reel her in and she was a fighter. Once I got her up to the side of the boat, Mr. Mike gaffed her and brought her on board. She went right into the kill box, which is a huge cooler filled with ice. Man, I wish we had one of those on our boat. Then I went inside the boat to go to the bathroom. And again, I heard Mr. Mike yell, “FISH ON! !” I couldn’t run outside and get to the pole fast enough. My dad was already in the chair. 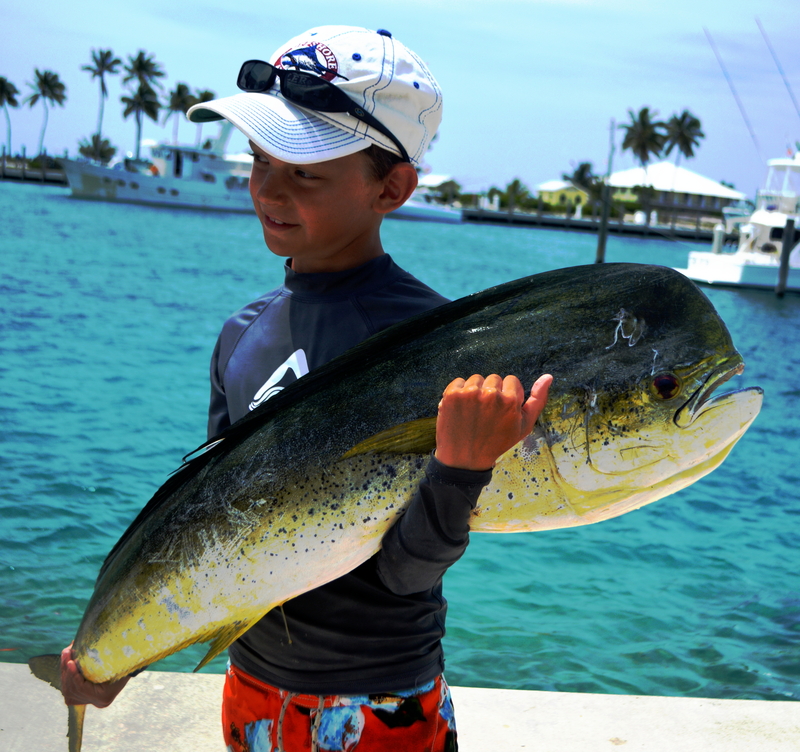 It was another Mahi, but this time a Bull (male). My dad got him to the boat and Mr. Mike again gaffed him and into the kill box he went flop, flop, flopping. We kept on trolling along the ridgeline. Then I was up top looking around for fish again. And again, Mr. Mike yelled, “Fish On!” “Another Fish On!” “Another Fish On!” “ANOTHER FISH ON!” I flew down the stairs like a fireman down a fireman’s pole. 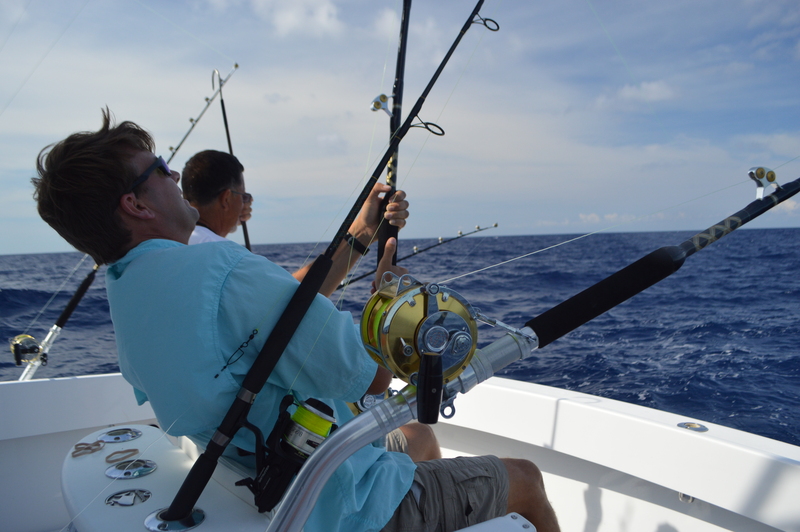 Mr. Mike said that were in a school of Mahi Mahi and he needed all hands on deck. All five of us were excited and got into the action. The poles were bending, the fish were jumping, the lines were crossing, and my heart was pumping. I knew we had four fish on, but I could only see three. Where was this guy? I looked closer at that line and still couldn’t see him. When I started reeling him in, the fish wasn’t jumping like Mahi do. Wait? Could it be? 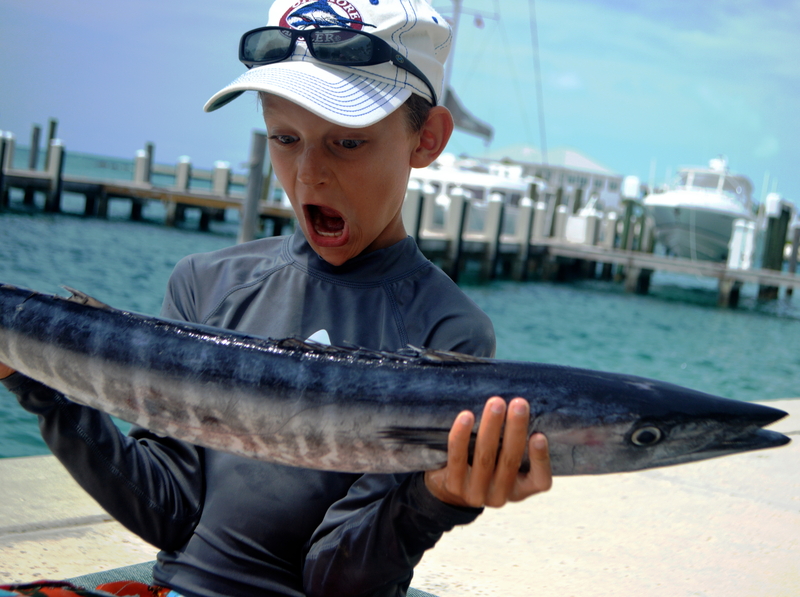 Could I have a Wahoo on? As he got closer to the boat, I saw him. My dream come true. 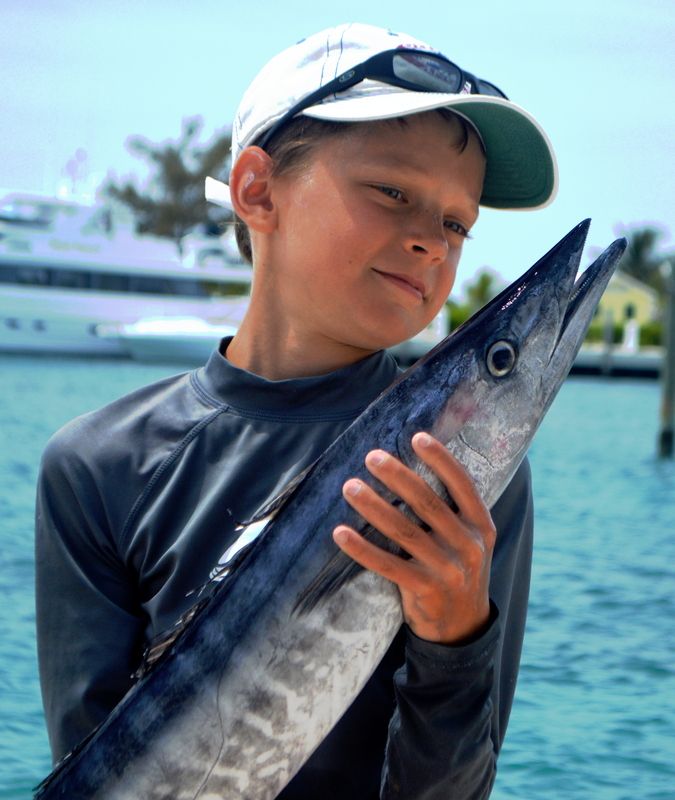 Wahoo on! My goal for this year was to catch a Wahoo and I did it! 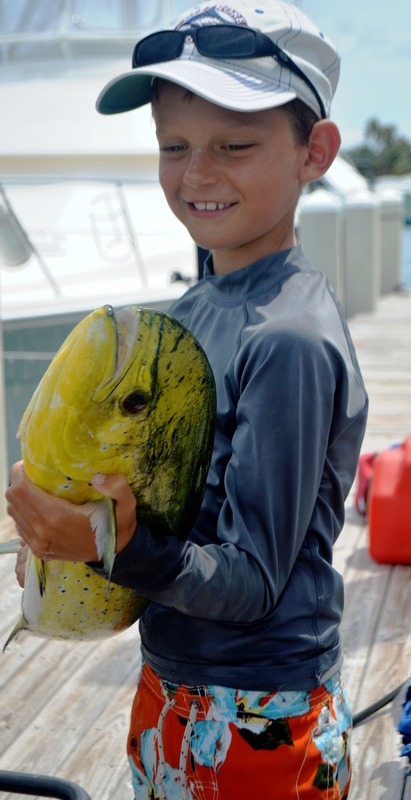 We headed back toward the marina and we hit another school of Mahi. 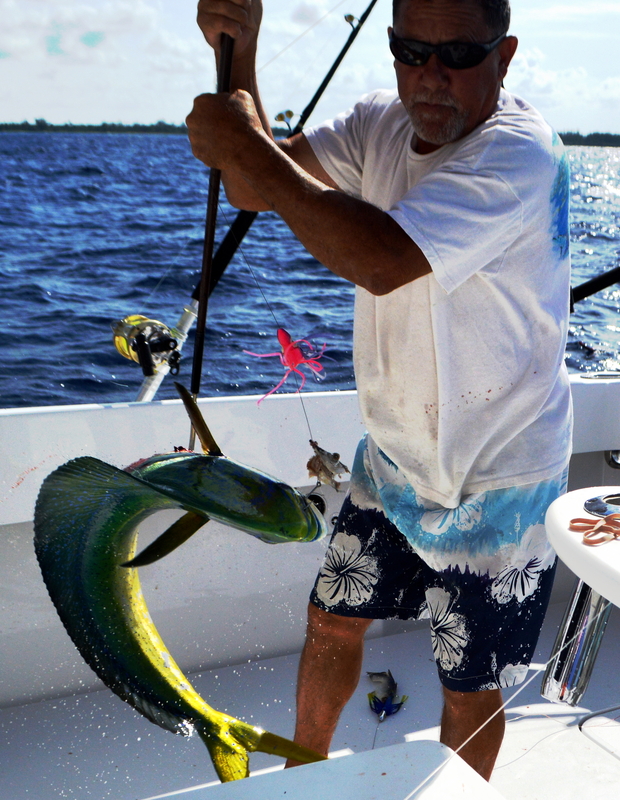 We caught five more Mahi and I couldn’t believe what was happening. It was crazy. The kill box was full so we floored it back to the marina. We had 11 fish! Here are some photos of the fish. We got the fish on ice and wheeled them to the filleting station. Mr. Tom and Mrs. Margaret gave me LOTS of the filleted fish to take back to our boat. They are the nicest people ever. I ate so much that night. I will never forget this day as long as I live. Thank you Mr. Tom, Mrs. Margaret, and Mr. Mike for making my dreams come true. I hope to visit you soon in Stuart, Florida. I’m so glad to have you as new friends. Enjoyed your story. Love the passion. What a wonderful story…so happy this young lad had his dreams come true. Cam, what a excellent job you did describing your experience! I absolutely felt like I was right there with you & holding my breath while you were reeling them in! What a fun, exciting day! Awesome!!! What a truly amazing day! 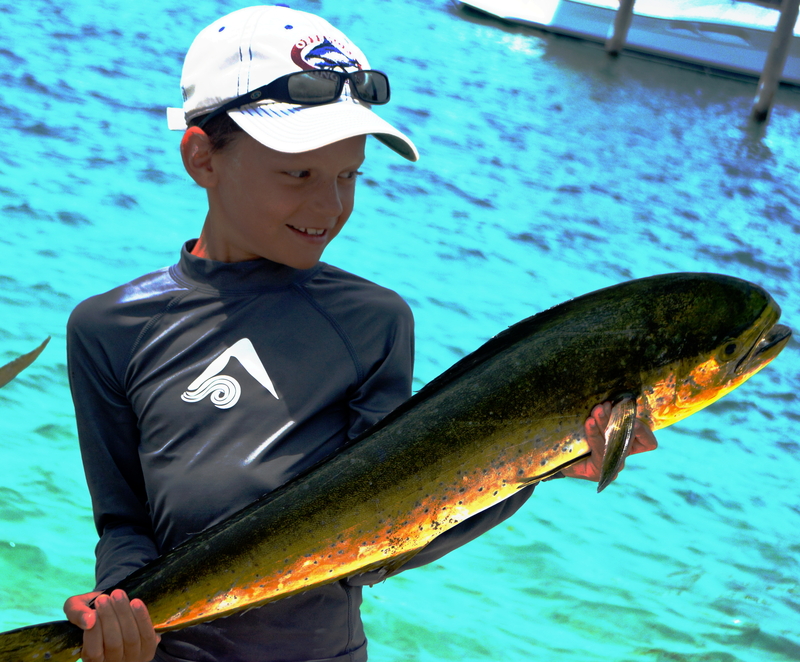 I love eating Mahi, but they are even more interesting to see coming into the boat. 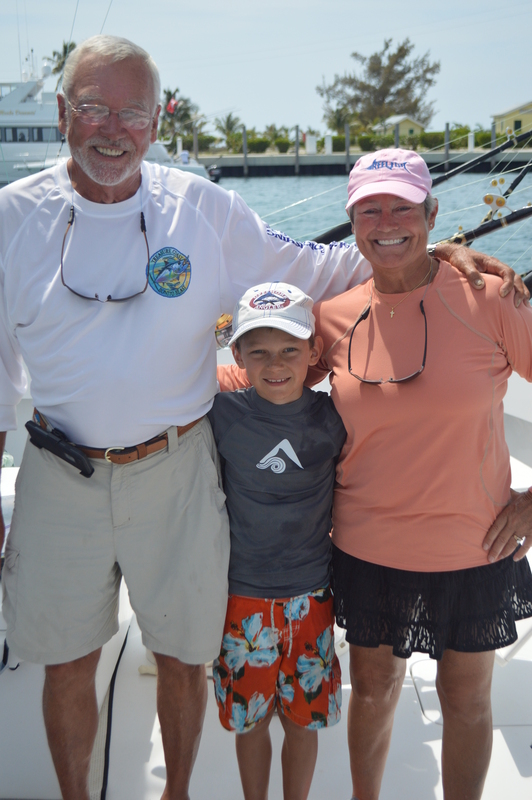 Congratulations on your catch, and on meeting such wonderful new friends! Cam – you’re the man!!!!!!! Your blog was pure joy to read – am smiling from ear to ear! Cockpit chaos , Chinese Fire Drill (as my Dad would say), sure is exciting when all the reels start singing. 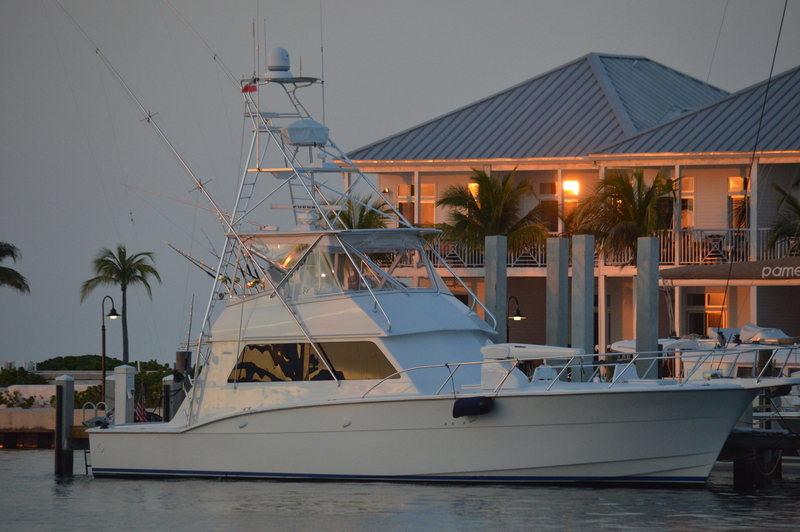 Have a great time in Georgetown , try to find someone to go Bonefishing with, there are some areas where it’s good, and they are fun to catch , and we return them to the sea alive and well. Great reading and photos. Cam, I felt like I was reading Hemingway and you should feel like you were living Hemingway… Here is your home work assignment: find out who “Santiago” is? Great story Cam! Sounds like you’re having a ball! Take care, love…Uncle Bob & aunt Kathy!! Great post! I was excited just reading it! Well, CONGRATULATIONS on your best day ever! You have worked hard, fishing the deep blue waters and I am so happy that your dreams are coming true! ENJOY all of your adventures as you travel and learn! Wow Cam, what an amazing day! I found my heart racing as I read your story which says that it was very well written!!! Congratulations on all your catches and best day ever! Thank you for sharing it with all of us!